The second beast of Revelation 13 is introduced in the next verse. (Go back to the previous page for commentary on the first half of Revelation chapter 13. Some see in the lion with eagle's wings of Daniel 7:4 a symbol of the partnership of the modern nations of the United Kingdom (the lion) and the United States (the eagle). The wings being plucked off is understood to be a symbol of the demise of the United States. This sounds kind of like a deadly wound as well. 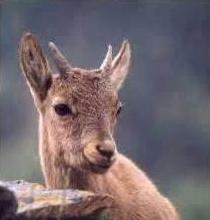 When this second beast of Revelation 13 comes out of the earth it is symbolized as having two horns like a lamb. It comes out of the earth which is often seen in contrast to the sea - a heavily-populated area - as a relatively sparsely populated area. Remember, from Revelation 12 that "the earth opened her mouth, and swallowed up the flood." This could be related to the relatively-sparsely populated New World (North America) providing sanctuary to those who fled from the persecution they were enduring in the Old World. 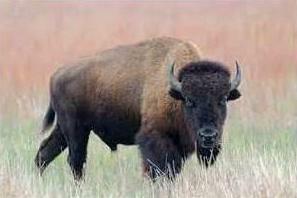 The bison's natural range is the great plains of the United States and Canada. Is it possible that the two horns represent two nations - the United States and Canada who will some day in the future form a union? 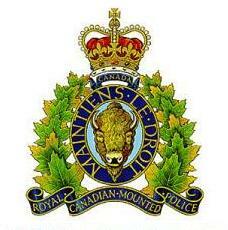 The bison is used in some Canadian symbols such as on the coat of arms of the Royal Canadian Mounted Police. If John did see something that looked like a bison it could be that he did not name it because he had never seen one before. In that case, the previously-stated purpose of this true prophet of God was to provide clear evidence of who was the true God. The purpose of the false prophet in the Revelation 13 scenario is to give evidence that this false god is actually the true God. He uses the same sign as evidence and is permitted to do so. However, we have been warned of this, even being told directly in this Revelation 13 that this will happen. It becomes a matter then of correctly understanding who this false prophet is and who is behind him. We also need to be careful of the signs and wonders that a false gospel based on sensationalism and miracles and emotions uses to promote a false gospel. A miracle-based religion working on the senses is not the same as truth from a Bible-based religion working on the mind and heart. The true gospel is a gospel of the heart and its acceptance is manifest by a change in the life to a life of obedience. It is the second beast of Revelation 13 that brings fire down from heaven in verse 13. That is done either by the power of Satan or it could be done in some technological way such as a star wars type of weapon. Go to the next page in this Revelation 13 study - the image to the beast.